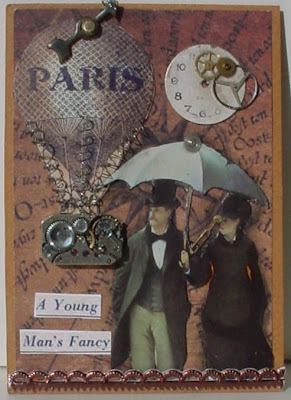 As promised here's another little Steampunk ATC. If you see in the background theres a little sneak peek of a partial image of a Paris balloon from a new plate being released next week from I Brake For Stamps. I am so enjoying playing with this new style of art. Start saving all those old watch parts ladies! 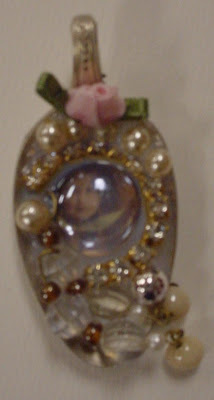 This also fits in with the The Three Muses challenge using Something Old Something New. Well I just had to give it a try. Its all the rage right now. 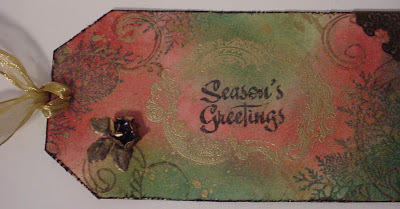 I'm having a blast playing with Steampunk. For those of you who don't know what Steampunk is. 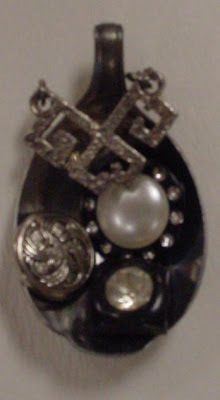 Its kind of a cross between Victorian meets modern mechanical. I have so much to share with you soon. 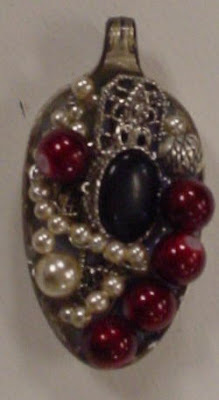 I've been doing some Steampunk jewelry, ATC's and some Steampunk Birds in the near future. Its pretty cool. 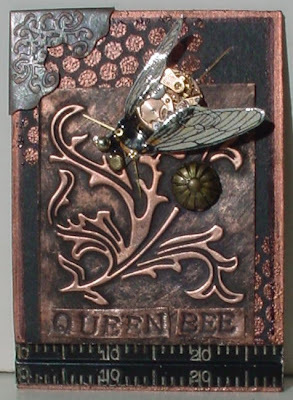 I'll just give you a little taste of whats to come with my Steampunk Queen Bee ATC. What do you think? 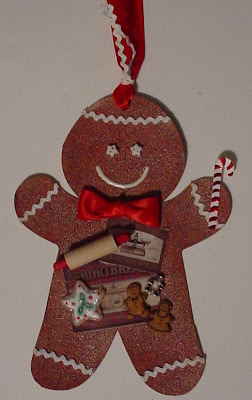 Do I Smell Gingerbread? 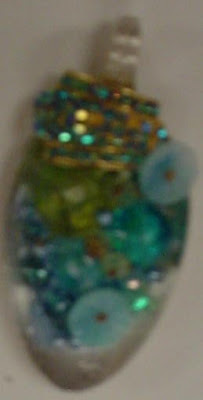 That's my name for the tag for the challenge at Kard Krazy this week. 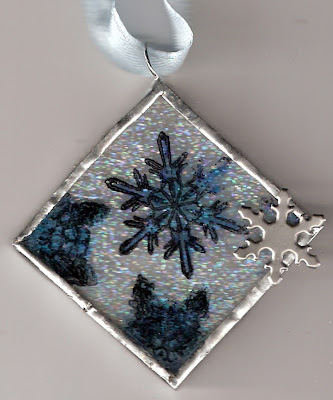 The challenge was to make a shaped tag. I cut some cs in the Gingerbread shape. 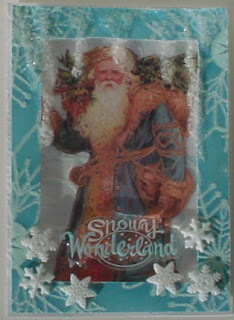 Embossed it with EP, added rickrack and some fun embellishment's.I might just leave this for Santa!! LOL. 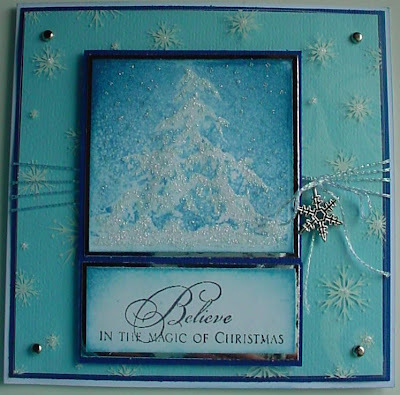 Thanks Louise for another fun Challenge. I hope everyone is ready for the big day. 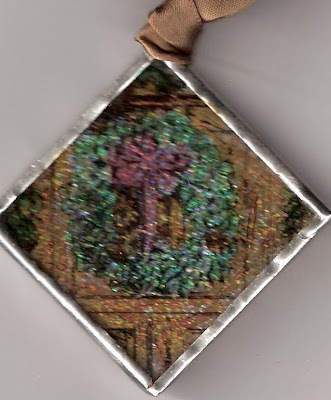 I had a little time this evening to make an ATC for the new challenge at Gothic Arches. Its open this week. 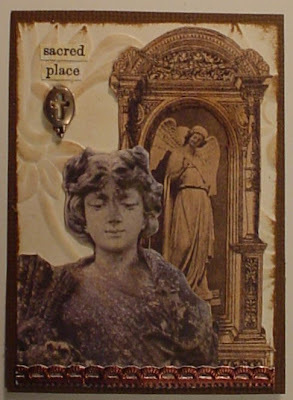 So I used the Statue collage image from Kelly's new sheet at collagevisions. The arch background is from Graphics 45. 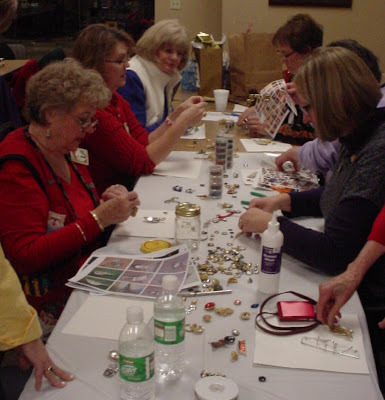 Earlier in the week the local stamp club I get together with had our Christmas party. 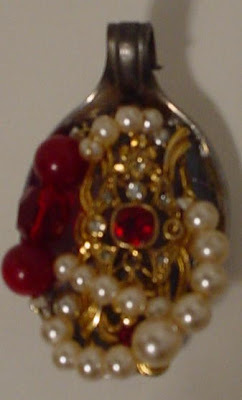 The project we did was spoon pendants. Since I hosted the project I didn't get a chance to play. 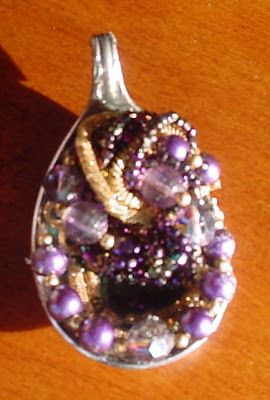 So yesterday I went to work making a few new pieces. They really are fun. 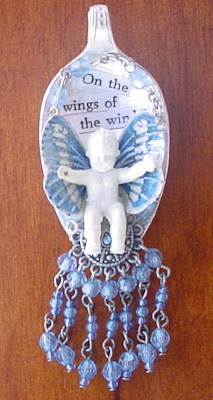 If your interested in learning how you can check the archives at Gingersnap Creations. I did a tutorial a while back that still on file. The following are just a few of the pieces the Diva's did at our party. I think they did a great job. It was alot of fun! Here's a picture of the ladies hard at work! I made this last year right after Christmas and decided it was about time to share it with you all. 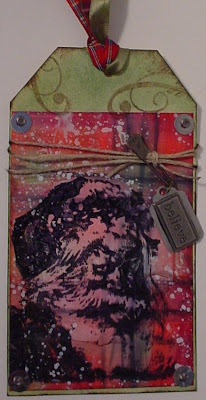 I made it from foam core covered with paper and stamped with Stampers Anonymous stamps. The photos are my brother and I when we were small. Yes the ones with the back eyes! LOL. My favorites can you tell? So are you counting down the days till Christmas? 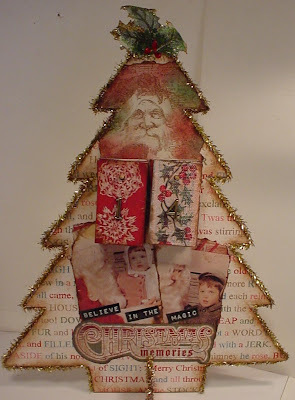 Also since Hels at http://pinkleart.blogspot.com has a challenge going on for Christmas. I think this fits the bill. Click the picture for a better view! I got the best package in the mail. 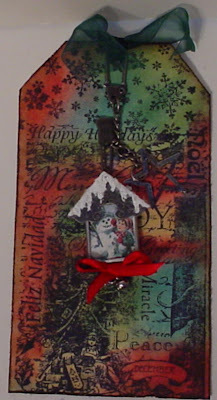 A Wonderful Christmas hanging from Hels at Ink On My Fingers. 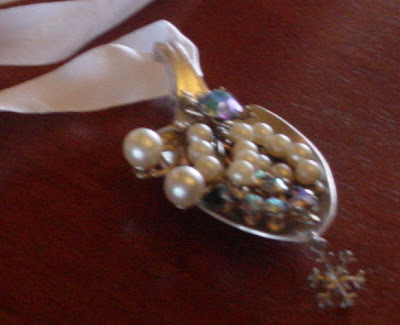 Isn't this just the cutest little hanging!!! 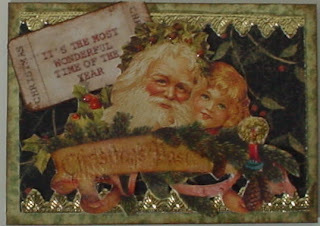 Also this Gorgeous Christmas card. These pictures don't do them justice. O.K Santa I still need that new camera! 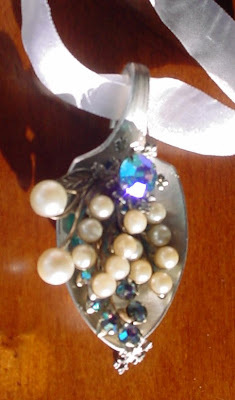 If you really want to see how Great they are stop by Hels blog for a look see. Thank you Hels!!!! 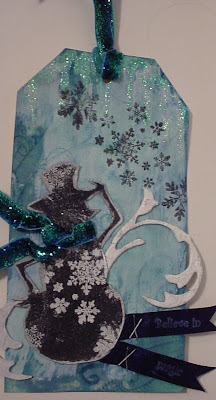 I used the Snowy woods images for my card of the week from Artistic Outpost and my technique from the newest TJ issue. 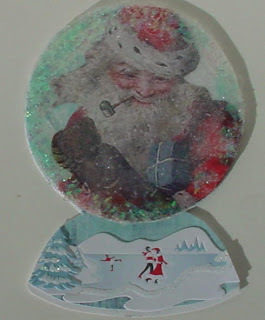 Well I was going to post these last night but when I came in to do so my Internet was down, I had a day off on Monday and managed to get caught up on Tim's twelve tags of Christmas. well now I'm behind again for 2 days but I'll try and catch up. These are not in any special order. 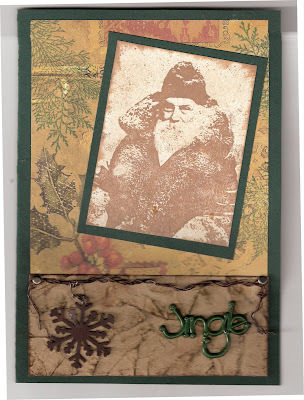 3/6 in the Vintage Santa Atc swap. 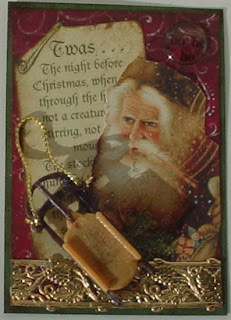 A couple of ATC's for a Vintage Santa Yahoo group swap. I thought I'd share 2 at a time. 2/6. 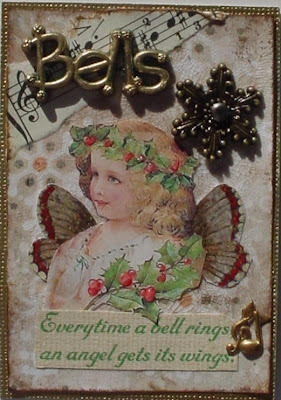 My final ATC in the Christmas Cuties Yahoo group swap. I hope you enjoyed my mini pieces!